These fun pizza faces are a great way to get the kids involved with making their own food and can be topped with any toppings of your choice. Combine flour, salt and yeast in a large bowl, make a well in the centre and add the oil and enough water to make into soft and pliable, but not sticky dough. Turn the dough onto a lightly floured surface and knead for approx 5 minutes or until smooth and elastic. Place the dough in a lightly oiled, clean bowl, cover with a tea towel and leave in a warm place for approx 1 hour or until doubled in size. Turn the dough out onto a lightly floured surface and knead for 2-3 minutes. Divide into 4 equal amounts, roll each into a round measuring approx 12cm in diameter and place on a lightly greased baking tray. Leave to stand for a further 30 minutes or until the dough has risen. Preheat the oven to 200ºC /Gas Mark 6. Spread the tomato sauce over the bases then mix together the cheeses and sprinkle equally over the bases. 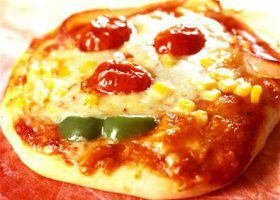 Use the remaining ingredients to top the pizzas, for example using the tomato slices as eyes, halved salami slices or pepper strips as mouths, ham strips as hair, sweet corn kernels as teeth or eyeballs etc until you have a family of fun pizza faces. Cook in the preheated oven for 8-10 minutes or until the crust is golden brown and the topping is bubbling. Use a palette knife to lift the base from the baking tray and check the dough in the centre is properly cooked. Serve immediately with salad or vegetables.